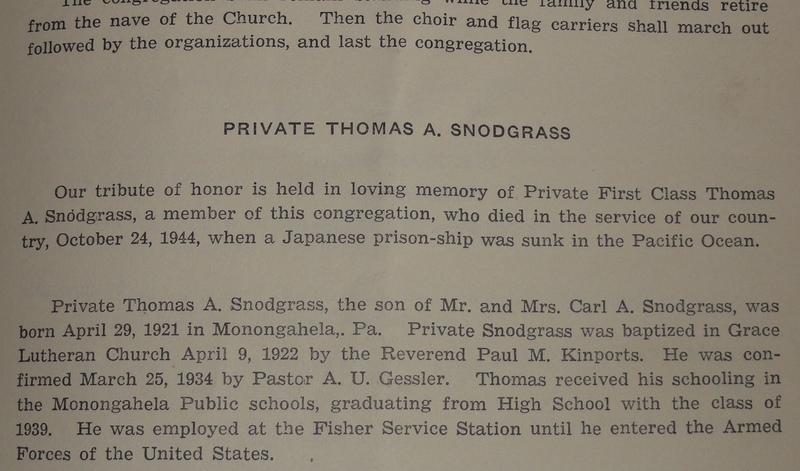 On the 17th of September, 1940, 19-year-old Thomas A. Snodgrass of Monongahela, Pennsylvania, traveled to nearby Pittsburgh and enlisted in the U S Army Air Corps as a private. Following his training, he arrived at Nichols Field near Manila in the Philippine Islands on July 9, 1941, where he served as Chief Metallist with an Army Air Forces ground crew. That is where Pfc Snodgrass was when the Japanese attacked the Philippines on December 8, 1941, just hours after bombing Pearl Harbor. On August 13, 1942, his family was notified that their son was missing in action. On January 30, 1943, they learned he was being held by the Japanese as a prisoner of war. He had survived the Bataan Death March and was doing his best to survive the extremely harsh conditions of PW Camp #1 Cabanatuan, PI. His family received occasional cards from Pfc Snodgrass up until they received word from the U S government that their son had died on October 24, 1944, when the Japanese prison-ship on which he was being transported had been sunk in the South China Sea. He was 23 years old. The prison-ship that took Pfc Snodgrass to his death was the Arisan Maru, a Japanese freighter that was a so-called hell ship used to transport POWs from camps on the Philippine Islands to camps in Japan. 1783 U S prisoners of war were crammed into the hold of the Arisan Maru, which had no markings on it to indicate it was transporting POWs. As the Arisan Maru was sailing along with a convoy of Japanese destroyers, it was torpedoed by the USS Shark, a submarine that was subsequently lost with all hands. After the Arisan Maru was hit, the Japanese crew locked the hatches to the hold, cut the rope ladders, and abandoned ship leaving the prisoners to their fate. The POWs managed to get the hatches open, and most if not all of them escaped from the hold. But then the ship broke apart and sank, leaving the men stranded in the water. Many tried to swim to the Japanese destroyers, which had picked up the Japanese crew, but the destroyers were moving away from the wreckage, and the Japanese crew on board the destroyers were beating off any POWs who got close. Only 8 of the POWs survived, and of those, only 5 escaped the Japanese and made it to China. The sinking of the Arisan Maru is the worst maritime disasters in U S history. To give you an idea of the scope of loss of life, more people died when the Arisan Maru went down than in the sinking of the Titanic. 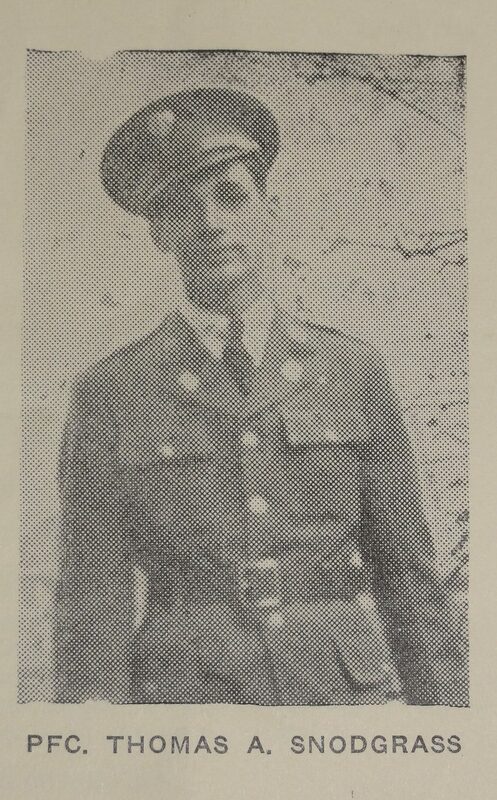 On this Memorial Day, please pause to remember people like my mother’s cousin, Tommy Snodgrass, and the suffering he endured and the sacrifice he made in military service to his country. Let’s remember people like my father’s brother John, who died when the B-17 he was piloting was shot down over France. There is nothing glorious in war, just death and destruction. Remembering those who lost their lives in war and honoring their sacrifice is perhaps the best way to remember that war is a horrible thing to be avoided at almost any cost. 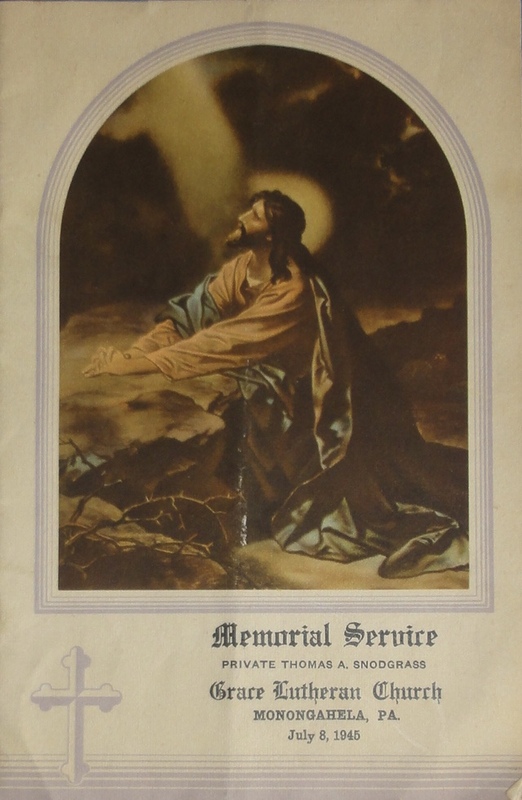 My mother kept the bulletin from her cousin’s memorial service all her life. I found it among her things after her death. A young man’s life ended far too soon. Very moving post, thank you. Thank you. I think Tommy’s story is absolutely heartbreaking. Thank you so much for this. I’ll remember Tommy this week, and the sacrifice he made to keep us all free.